This article is geared towards the entrepreneur who works from home. You might be a parent who needs to be there for your kids at certain times of the day, or maybe you are disabled, and working out of your home is the most practical or only possible option. Or maybe you’re just someone who is lucky enough to live in a place where you have enough privacy, space, and good wifi to facilitate your presence there. In any case, there you are working at home, trying to build your business. There are some great things about working at home. The aforementioned flexible schedule is one of them. Your home, your rules. You can work at any hour during the day or night that you choose. You can work around family needs and personal preferences. If you want, you can stay in your pajamas all day. You can cook a meal when you get hungry, and use the bathroom without waiting in line. All great features to the work-at-home arrangement. But there are some challenges inherent in working out of the same place where you live. And they can get in the way if you’re not careful. One of the pitfalls of working at home is that you’re at home. What do I mean by that? Well, think about it. Unless you have a completely separate room to use as an office, where you can close the door and shut out the rest of your personal life, you are bound to be distracted. There are dishes to be done, there’s laundry to be washed and folded, and oh, there’s that pile of bills you’ve been meaning to pay. There’s a never-ending stream of unfinished business at home that can take your focus away from your business priorities, especially if you’re struggling with an unpleasant task that makes you feel like procrastinating. I can’t tell you how many times I’ve walked away from an annoying work challenge in the middle of my day to do the dishes, or cook up a pot of soup. Those are my go-to relaxing tasks. Sometimes, it does help to step away from something if it’s frustrating you, to get a little perspective and then go back to it later. But if you’re not careful, you can lose focus by getting endlessly caught up in domestic activities, simply because they are right there, in your face. Hot tip: Set up a separate work area that you designate as your office space. If you have a whole room dedicated for that purpose, great. If not, then make sure the space around your desk is neat and uncluttered with items that are likely to distract you. Unless you live alone, you will be coordinating your work time around a partner, roommate, or family members. Make sure you do what you have to do to maximize the time you have for yourself. Synchronize schedules with other residents so that you can accommodate each other’s needs with as little friction as possible. You will need to make sure you can get in a minimum number of uninterrupted hours to comprise a designated work week. Productivity is key, and time management is fundamental to being as efficient as possible. 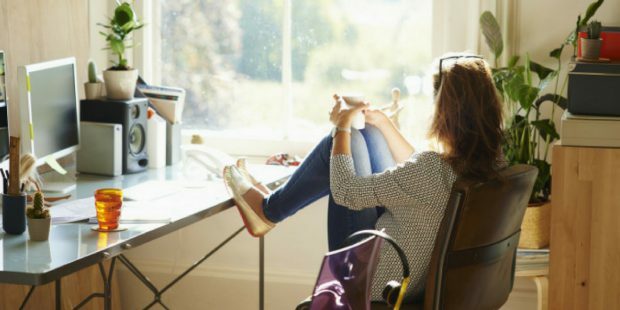 #Entrepreneurs, survive #working at #home with these 3 tips. Parents may want to give extra consideration to programming in some quality time with your kids. I can say from experience, that making this a priority is a reward in and of itself. Honestly, they grow up quickly, and if you have the benefit of being able to see them during daylight hours and integrate that time into a practical work schedule, then count yourself lucky. At the same time, it’s good to teach them that there are times when you are not available. Your children will benefit from seeing you model productivity, and they will learn the difference between mom and dad doing what they need to do, and then taking some time for playing or other leisure time activities. Most importantly, you’ll want to make sure that you save yourself enough down time. There’s a tremendous potential for becoming a workaholic by losing all boundaries between work and personal time. It may seem like a good idea to push far into the night to get more done, and there may be those times when it’s necessary to push like that, to meet a deadline or complete an important project. But if you work like this for too long, trust me, you are going to burn out. We all need down time. We have to recharge our batteries and get some perspective, particularly when we’re being creative or engaging in problem-solving. Over time, you’ll find your balance. You’d better. Your success depends on it. Even though you work at home, you still need to differentiate between your work day and your free time. Without the formality of going into an office, it’s easy to blur the lines between on duty and off duty. It may be tempting to work in your jammies. The novelty of that is pretty fun at first. But personally, I think it pays to put on some kind of work clothes to make you feel like you are “at work.” It has a positive psychological effect. But there are other ways to launch your day that will help you enter your work headspace properly. You may want to start the day with a quick meditation or a workout. I like to get up early enough to do a workout routine, followed by a shower and a cup of tea, and be at my desk, ready to go by at least 8:30. Then, I give myself a little time to catch up on emails and check my social media platforms for anything interesting I may want to share to set the tone of the morning. If I haven’t done it the night before, I then create a to-do list of the things I intend to accomplish that day and get to work. Bringing structure to your day begins and ends with your commitment to framing it out as positively as possible. I like to make sure that I’ve mapped out my goals for the day and that I don’t stop until I’ve met them. I will often arrange to give myself a treat at the end of the day as a kind of reward for doing a good job. This could be anything from watching a TV show I like, spending some time with my son, relaxing with a good book, or playing some music. Whatever you can do to motivate and inspire you to get through your daily agenda, do it! Whatever works. It might be a hot bath and a glass of wine. Or maybe you just want to crawl into bed early. The nice thing is, you can do it because you work at home.